This is one of the best water filtering systems available on the market in 2019. 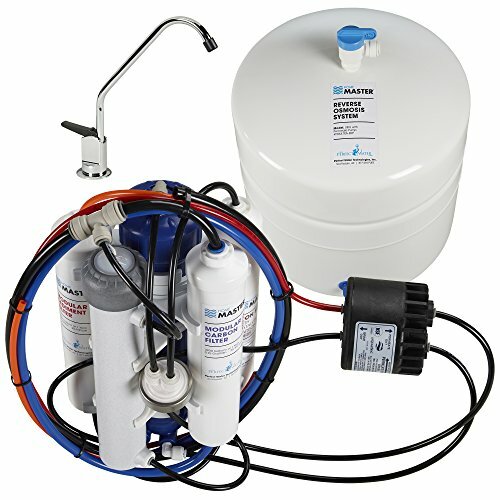 In our Home Master ULTRA-ERP review, you will see why this is one of the most popular reverse osmosis (RO) systems today. Unlike other RO systems which are very good at filtering the water, but do it by wasting a lot of water in the process, this model is very efficient. Reverse osmosis systems can produce up to 20 gallons of wastewater for a gallon of pure water they produce, with the best of them wasting as little as 4 gallons of wastewater for every gallon of pure water. This model, however, is able to waste only 1 gallon of water for a gallon of filtered water it produces. Not only is this model very efficient when it comes to wasting water, but it is also very good at filtering the water. The Home Master ULTRA-ERP will remove 98% of the solids, metals, and chemicals present in the water, and 99.99% of the microorganisms, producing the best drinking water. Another great thing about this model is that it uses a permeate pump. This pump will reduce water waste by as much as 80% while it will increase the water production by up to 50%. 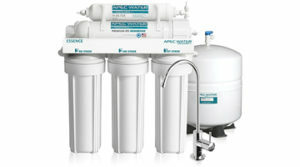 The Home Master ULTRA-ERP is one of the most efficient reverse osmosis systems available on the market. With a wastewater pure water ratio of 1:1, you will save a lot of money using this water filtering system in the long run. This model also uses a permeate pump that will increase the water pressure and the total quantity of water produced. This model has a modular filter design. This design is better and easier to use than the canister filter design used by other models. The most important differences between a modular design and the canister design are the ease of access and durability. When a canister model is used, only the filters are changed, while the filter housings remain the same. This represents a weak point in the design, as some of the filtered sediment and microorganisms can accumulate in the canisters and weaken them in time. This may lead to leaks and ultimately to permanent damage. A modular filter design uses filters which are incorporated into their housing, so you can throw away the entire filter when you change one. These filters are also more durable. You can change them once every year, or when you estimate they filtered 3,000 gallons of water. The filters are easy to change, and you don’t need any tools for this operation. Installing the Home Master ULTRA-ERP is very easy and straightforward. You can install the entire filtering system in under an hour if you have some basic DIY skills. The installation kit contains everything you need for the installation, but you should also keep a Philips screwdriver, a crescent wrench, and a drill close at hand. The installation guide is very easy to follow and it goes into great detail to explain how to connect the RO system to the feed and drainage pipes. If you’re one of the people who would rather watch an installation video guide than reading an installation guide, you’re in luck. Home Master developed a series of 6 instructional videos which will help with the installations process. You should be aware, however, that the videos will only help you with the basic system, so you will still have to follow the installation instructions in the written guide when you have to install the UV light. This model is designed to fit under a standard kitchen counter cabinet, but you will be able to install it everywhere you have a feed line and a drain. You should keep in mind that you’ll have to change the filters every year, so you will have to make sure you have enough space for this operation. Great Water Output – This model is capable of producing up to 50 gallons of filtered water per day. This is a large quantity, so it will even be a good addition for small business owners. UV Filter – The UV filter will kill 99.99% of the microorganisms usually found in the water. Efficient Filtration – This reverse osmosis filtering system is capable of removing up to 98% of the sediment and other contaminants in the water, including iron. Filters Are Easy To Change – Not only are the filters easy to change, but they are also durable and long-lasting. You can change the filters once every year or after they have filtered 3000 gallons of water. Needs Electricity – Since this filter uses a UV light to kill microorganisms, it will need electricity to power it. Short Power Cord – Some customers complained that this unit’s power cord is too short. Make sure you have a power outlet close to the installation spot.